Sustainability will not be achieved if it remains at a small scale. Although very localized efforts count–they shine a light towards what is possible–they do need to scale up to a broader impact if they are to indeed create sustainability. How to scale impact is an ongoing question for any social change agent. In 2010, through the extensive Integral Without Borders (IWB) network, we met a contact in the fourth largest retailer in North America who was keen to see how an integral approach could be brought into action in her work with global value chains. Over the subsequent few years, One Sky (a partner NGO to IWB) carried out a 18-month experiment with one of that company’s main buyers and it’s Brazil nut value chain in Peru and Bolivia. The experiment was an integral leadership program for all actors involved in the value chain, from the indigenous people living in the forest communities who gather the nuts, to the processors and transporters, to the exporters in Lima and the USA. IWB supported this endeavor with curriculum design and in connecting One Sky with integral coaches, Big Mind facilitators, as well as an Advisory Board that included several important voices from both business, social change, and integral theory. This One Sky experiment was successful in fostering greater self awareness and group trust across the entire value chain, which in turn supported better communication, more resilient problem-solving collectively, healthy team dynamics, and (from what initial results showed) also greater productivity. Over this time and since, the company began it’s own journey exploring what it might mean to apply some of the concepts from the book Reinventing Organizations by Frederic Laloux into how it carries out a global business. The primary concepts in that book articulate how an organization might evolve towards a more coherent, integral expression both in terms of internal management as well as external engagement. These concepts include self-management, wholeness, and evolutionary purpose. Self-management refers to an entire suite of changes within an organization that shift it from operating like a machine to operating more like a living ecosystem. For example, rather than top-down management the organization uses self-management, where bosses of staff become coaches to their teams. Wholeness refers to the integration of aspects of ourselves and our systems that are usually severed or held separate, such as: mind and heart, the personal and the professional, masculine and feminine, productivity and ethics, economics and environment, and so forth. How does an organization orient towards a more integral stance, whereby these aspects of ourselves and our systems can become part of a single, coherent whole? That is both the question, and the challenge, put forth by Reinventing Organization, which is being unpacked and translated uniquely across many organizations today. Finally, Evolutionary Purpose refers to a way of aligning one’s organization to it’s deepest, unfolding purpose. Often we settle for much less. A company may settle for a good bottomline, or a nonprofit organization may settle for a series of quantitative indicators that attempt to tell us if we are on track, but often these don’t tell the whole story. And that whole story matters. Why do people actually show up inspired at this job? What do the Board of Directors feel proud of? What does this organization offer the world that is unique and unprecedented? Honing in on that deep evolutionary purpose is part of this process of reinventing organizations, as it sets a new North for one’s organizational compass. With this, objectives become easier to identify and the most important impacts easier to track. Inspired by the previous integral leadership work, as well as intrigued by the company’s new inroads with Reinventing Organizations, the Peruvian branch of the company put forth the question: What would it look and feel like to engage in a process of Reinventing Value Chains? 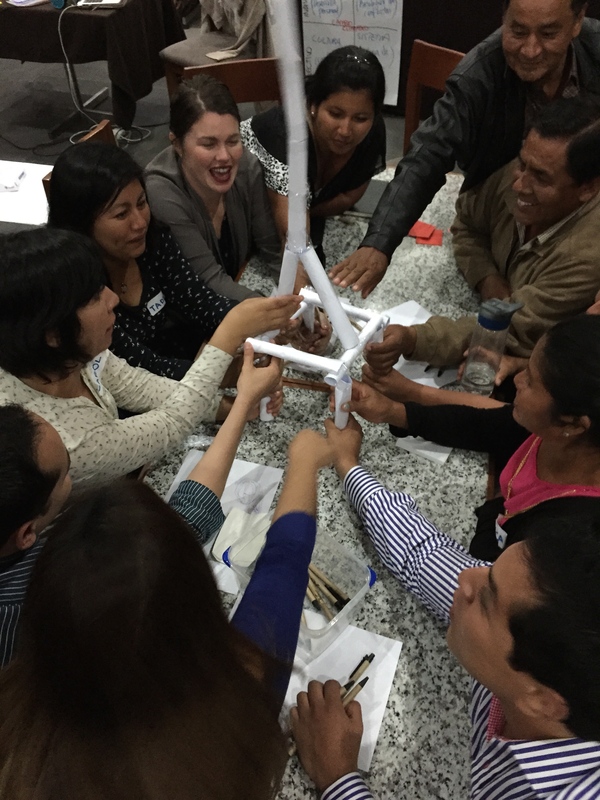 In November 2015, two IWB facilitators began such an inquriy with two of the company’s value chains in Peru and Bolivia–Brazil nuts and artichokes. Francia Mazzo and I designed three-day retreats for both value chains, laying emergent ground for an inquiry into how these concepts of self-management, wholeness and evolutionary purpose could be applied to the value chains. Our challenge was to provide ways for participants to apply, embody and literally inhabit these concepts themselves. It does precious little to simply present these concepts theoretically. In fact, with material like as is in Reinventing Organizations, to keep this theoretical can be really off-putting for people, and possibly even unethical. Rather, these concepts need to be translated into one’s own worldview to become useful. And for that, we needed to create activities and processes by which participants could learn, make sense of, and apply these concepts to their own work and relationships within the value chain. Francia is from Chile. I met her at IWB’s event in Bogota just a month before, and based on sheer intuition we felt like we could work together one day. Well, that day came sooner than either of us could have imagined, and true to intuition, our connection in designing and facilitating ended up being smooth, coherent, and very creative. Prior to landing in Lima, neither of us knew about the other’s skills in design, facilitation or holding space for self- and group-awareness practices. The fact that we gelled so fully and smoothly, and even that we met at all!, is a testament to the power of the IWB network. We are compiling more details on what we actually did with the two value chains, a notes-from-the-field to share with other practitioners, to be published in the new year. For now, suffice to report out on the feedback from participants. Some from the Brazil nut value chain said this was the best workshop we had yet done with them. Others from the artichoke team said that, “the workshop was powerful and diverse, touching on themes that were new and intellectual for our team, while also remaining personal and even spiritual.” We can see ways to make these interventions more effective in the future, and are curious how things will go for these value chains moving forward… As the question is now: how will this land in practice? The fortunate news is that because these are both value chains of a company that is, as a whole, committed to exploring these concepts, there is a lot of cultural and systemic support to make some pretty profund changes in how business is carried out. That is, many innovators and early adopters do this without such a supportive current to carry it forward. In this case, while we can’t yet say where it might go, we do know that there is no glass ceiling. And, circling back to the opening point about scale… Consider how a small, exploratory change within these value chains amplify along the chain simply by the sheer volume of goods being sold between the company and the fourth largest retailer in North America. It’s no small matter what we are talking about here. While yes these are small experiments, because of volume and exposure, it is scalable, and its impact has the potential to be vast. The products are part of a sweeping cultural change in the value chain, where people throughout the company are sincerely asking such things as: how can people be given more creative decision-making responsibilities? how can their human dignity and potential be foregrounded more fully? how does greater awareness and capacity at all points of the value chain actually translate into innovative practice? what kind of communciation is possible if the organization operates like a living ecosystem (instead of a machine in which workers or producers are often exploited like mere cogs)? how can a premium be paid on these products (not as part of an exceptional ‘organic’ or ‘fair trade’ label but simply as part of good business practice) to generate proceeds that can be reinvested back into producing communities and ecosystems? How those questions become lived and answered through action is something we are very much looking forward to seeing, and perhaps supporting, in the coming months and years. It is with gratitude and honour that IWB be part of such an endeavor. We will post a longer report soon, with greater detail in terms of design and some practice tips for ourselves and others.